The first few days after the massive earthquake proved chaotic for the hospitals in the Capital, all of which were overwhelmed by huge numbers of patients both from inside and outside the Valley. But now that the quake has whittled down to tremors, they are gradually returning to normal. The Trauma Centre at Mahankal Marga received the highest number of patients injured during the Great Earthquake while the Tribhuvan University Teaching Hospital performed the largest number of surgeries. The only Trauma Centre in the country cared for up to 2,000 patients after the major jolt on April 25. As of Saturday, the centre has conducted 98 major surgeries for spine, limbs and head injuries.”Over 100 patients are still admitted to our wards, while the 11 ICUs and beds in Emergency are still occupied,” said Dr Ganesh Gurung, Vice-chancellor of the National Academy of Medical Sciences that operates the Trauma Centre. Dr Gurung added that normal services could be some time away. “One of our buildings where the ICUs are located has been marked Red, meaning that it requires reconstruction or retrofitting. Also, many staff members are not mentally prepared to enter the building,” said Dr Gurung. While the newly-opened Centre is inching towards normalcy, things seem to be getting better at the TUTH. The hospital has started regular out-patient department while all the general surgical units have become functional since Sunday. In the aftermath of the earthquake, the TUTH provided medical services to 1,350 patients. Slightly over 300 surgeries were conducted by Sunday morning. During the first few days, the emergency building of TUTH was used to treat the most critical patients, while the lobby of the adjacent BP Koirala Lions Centre for Ophthalmic Studies was assigned for those with normal injuries. However, starting from Sunday, the ophthalmic centre has resumed normal services and is now treating eye cases. Dr Deepak Mahara, director of the TUTH, said they could move into action “pretty fast” as the hospital buildings, which were built by the Japanese government, were not affected by the quake. “Just a few hours after the earthquake, we began operating patients indoor,” said Dr Mahara. Initially, most of the patients were taken out to the open, but later the hospital administration convinced them to move in. A team of engineers were immediately called to inspect the buildings. Around 500 patients are still admitted to the TUTH and a majority of them are likely to be discharged by next week. Meanwhile, the Nepal Orthopaedic Hospital (NOH) in Jorpati is facing an infrastructural crunch. A row of tents, starting right from the hospital entrance, shelters patients and their caretakers, while doctors and medics remain in another tent in the middle of the ground. Inside, all the beds are occupied. “We are trying to get things back to normal. 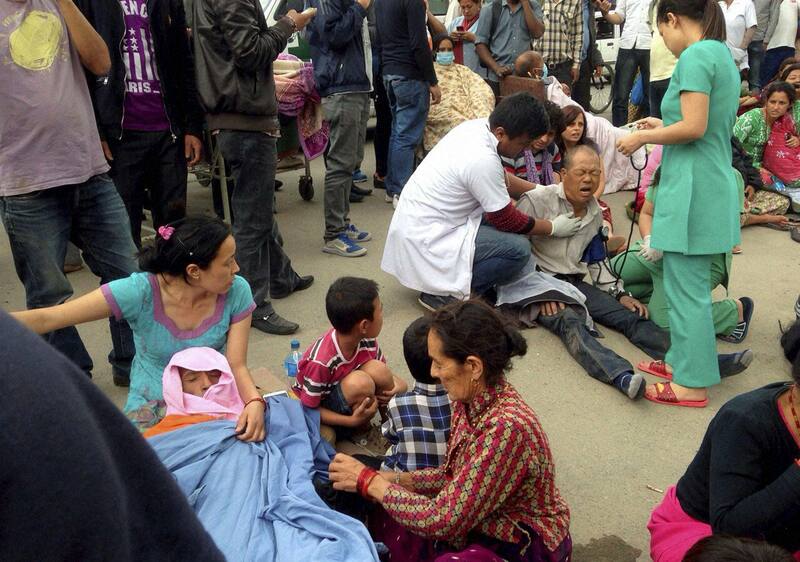 On the day of the quake, we had to move patients out of the hospital four times,” recalls Dr Anil Shrestha. NOH, as of Saturday evening, has treated 813 patients, while over 150 are in the In-patient Department. Dr Saju Pradhan, medical director of the hospital, said they have performed 77 major surgeries. The hospital saw a large number of patients from Sankhu, one of the worst-hit areas in Kathmandu , and other nearby areas. “There are still 60 patients waiting for surgery,” said Dr Pradhan.